Ha! This tickles me no end. It's like my Nana used to say, "Nothing is 100% good or evil." No doubt because she came from Nottingham (which abuts the Sherwood Forest), Nana used Robin Hood as example: "Stealing from the rich to give to the poor...was a generous thought, but it was still stealing." But yeah, the reverse is also true, as evidenced by this graffiti. 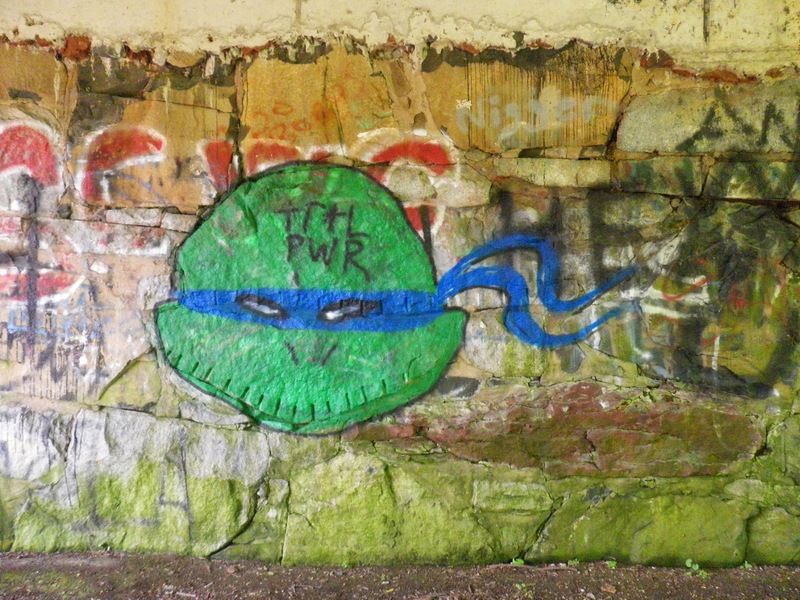 Yes, it's an act of vandalism, but hey, it's TMNT! This reminds me of my first glimpse of the Mirage TMNT, in fact any version not inspired on the Fred Wolf animated series which was a graffiti Leonardo on the wall of a train yard I'd pass as a child. It was strange to me as Leo had a red bandanna, different styled bets and pads and he was in a much more dynamic pose than I was used to seeing on turtles merchedise. Little did I know at the time it was a great recreation of the character from tne cover of Leonardo Micro Series #1.